Vigyan Prasar is engaged in the development of new training modules/methodologies/ equipment/ devices for S&T communication. Scientific Experiments using Computer is a novel effort to explain to the students how computer is useful in measuring and controlling physical parameters and processes.VP has conducted a number of demonstrations and workshops to explain how experiments on measuring and controlling parameters like temperature, intensity of light and sound, humidity etc. could be taken up to illustrate use of computer in a variety of processes. Can one use a computer as a multi-meter? Or say as a thermometer? Scientific Experiments using Computer is a software and hardware interface that has been developed by Vigyan Prasar to do that and much more. Through this interface not only can one measure common physical parameters like temperature, light or sound intensity, relative humidity, etc., using a commonly available computer but also control a few parameters so that it remains within the set value. A student usually looks at a computer as an upgraded typewriter or a device like television with Internet access. School students of classes V – XII write reports, browse the Internet, play computer games and also do a little bit of programming, often without knowing how that is useful! All students know that computer is very powerful – it can be used to navigate the space shuttle, or control sophisticated machines/processes. However, most of them do not have any idea about how computers do it. Controlling any process do require measurement of a few parameters like temperature, light, humidity, etc., and taking appropriate measure based on the comparison between the set value and the measured value. For example, if measured temperature is more than the set value then a heater can be turned off. Scientific Experiments using Computer is an effort to explain to students how a computer is useful in measuring physical parameters and thereby controlling a process by feedback mechanism. Any physical stimulus like temperature, sound/light intensity, etc., is first sensed by suitable sensors. Sensors produce an output voltage, which is comparable to a physical stimulus. Output of the sensor is fed into the Analog-to-Digital Converter (ADC). The output of the ADC is digital, suitable to be fed into the computer through a parallel port. The digital value thus received is processed by the computer, which produces the output. The output is in two forms – first, it displays the value of the physical stimulus on the computer screen, and second, it sends command as a feedback signal. This feedback signal is able to switch ON/OFF an electronic switch. The second form of output is important for process control. The computer, based on the comparison between the received value and the set value, generates this feedback signal. Let temperature of a process need to be monitored and to be controlled within a set value. An electrical heater is the temperature source for the process. Here, a temperature sensor continuously senses the temperature and the computer displays the value. If the received value is within the set value, the computer will send a 0 (Zero) – Logical False – as feedback signal, and the heater switch will be ON. The moment the received value exceeds the set value, the computer will send 1 (One) – Logical True – as feedback, which would trigger a relay and switch off the heater. The computer will keep on sending 1 as long as the received value exceeds the set value and the heater would be switched off. After sometime, eventually received value would be within the set value and the computer would send 0, which would turn on the heater through the relay. This closed loop monitoring would continue as long as the monitoring and controlling of the process is required. The interface has two components – hardware interface and software interface. Both the interfaces work in tandem. Hardware interface consists of ADC, electronic switch and sensors and is connected to computer through standard parallel port. 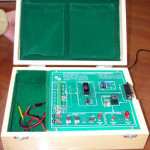 The interface enables one to read a physical stimulus through sensors, convert it to digital form before feeding it into the computer and operate the switching circuit based on the instructions received from the computer. Different sensors are used to sense different stimuli. Sensor converts the stimulus to a corresponding voltage level. Higher the intensity of the stimulus, higher is the output voltage generated by the sensor. However, the relation is not always linear. Non-linearity or exponential relation between input and the output parameters can be taken care of at the time of data processing by the computer. The output voltage is converted to digital form by ADC. One 8-bit ADC is used in the interface. Any input voltage is converted into a 8-bit combination. The switching circuit consists of transistors and solid-state relays (SSRs). Transistors are turned ON or OFF, based on the control bit received from the computer. The transistors in turn operate the relays. The relays are connected to external devices, which can be turned ON or OFF so that the measured value remains within the set value. The SSR is able to handle high current and voltage so that external devices like heaters and lamps can be connected to the standard power line through the relays. Relays are operated by electromagnetic induction. Therefore, there is no direct contact between the hardware interface and the external power line (in India standard household supply is 230 volts, 50 Hz). The software interface is the controlling unit, which processes all the input data received from the hardware interface. Digital data (Byte) is compared with the set value and control bit is generated and sent to the hardware interface to turn ON or OFF the switching circuit. The user can sit in front of the computer and can control the entire process by selecting the required sensor and setting the upper and lower limit of the parameter. Once the parameter is set, the feedback control continuously receives the data through the hardware interface and compares it with the set value. This can continue indefinitely without any human intervention. The software interface also plots real-time graph and stores all the data in database. These data can be retrieved any time for possible data analysis. Switching circuit: Made using transistors and relays. Any standard computer can be used for the purpose. Install the software in the computer. Follow simple instructions when installation is in progress. Once software is installed, connect the interface unit to the parallel port [also known as the line printer terminal (LPT) Port] of the PC. Connect sensors in the slots provided with the hardware interface. Senior secondary science students can do physics and computer based experiments using this interface. As all the measured data is stored, one can analyse the data for a definite period of time. The interface provides scope to add new sensors and testing the same. Till recently computer-controlled processes were considered to be the area of engineers who use very sophisticated tools. Scientific Experiments using Computer is conceptually the same as one visualizes in an industrial process control. One might not get the highest level of accuracy in measurement required in a real-life control – but one can definitely get a feel of the same. The main advantage of this interface is the variety of sensors and different parameters it can read and control. The interface may be treated as the gateway between the physical world and computer. Get or derive a new sensor, connect with the hardware interface and do a new experiment. The types of measurement and control possible are limited to one’s imagination only! Vigyan Prasar organises demostration/workshop on scientific experiments using PC to train students and teachers.